﻿What are you going to be for Halloween? I still remember my baker's costume winning an award in elementary school. Come to think of it, I still use the exact same wooden spoon I carried to, ya know, stir my SpaghettiO's. That fantasy clearly wasn't an accurate premonition. One suggestion is to just think back and pick out some of your favorite (or just ridiculous) movies, TV shows, etc. and dress up as a character or with a group of characters. the characters in the game, Clue. You can also just be totally random. Dress up as a tourist and wear a Hawaiian floral shirt, a camera around your neck, carry a giant map, and have a look of utter confusion. Dress up as static cling and wear all white clothes and have random clothes (socks, etc) and dryer sheets safety pinned to you. Dress up as Smartie Pants and hot glue Smarties candies to a pair of old pants and wear nerd glasses. Dress up as the Hamburglar. Take some white pajamas and make wide horizontal stripes on them with a black marker or tape. Add a wide-brimmed black hat with a yellow hatband, a black cape, some red sneakers, red gloves, and a red tie with hamburgers on it. Wear a bandit mask (cut eye holes in a piece of black fabric and tie it around your face). Carry a McDonalds bag with a burger inside. 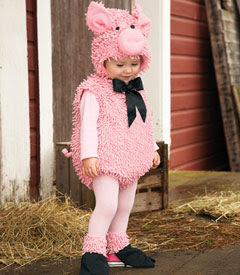 Here are some neat costumes for kids. Want to dress up with your dog? Do this.